Special rates and booking code for the Rio NOW Available for Supernats 14! The special room rates and group code to be able to reserve your rooms at the Rio for SuperNationals XIV are now available. Click HERE for the website link, toll free phone number and special SKUSA booking code. See you in Las Vegas! Deadline to Pre-Register for the Pro Tour Summernats in Shawano is THIS Sunday, July 4th! With the summer season now in full swing, the Superkarts! 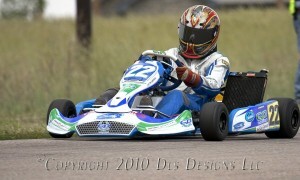 USA ProKart Challenge South is reaching the final few legs of the 2010 season. 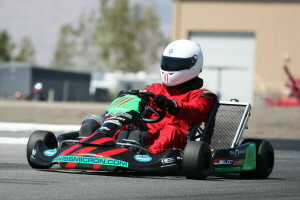 Started back in January, the six-race championship series hosted the fifth round of the tour at the Buttonwillow Raceway Park kart track in Southern California. The turnout brought together the solid core of top-notch drivers and teams that make up the PKC program. Showing the way in the headline divisions were the point leaders heading into the weekend – Clinton Schoombee and Phil Giebler – as both took home the feature victories in the S1 Pro Stock Moto and TaG Senior categories. Schoombee was untouchable on the day in S1 as he swept the event’s activities. From qualifying, where he posted a fast lap of 47.097, Schoombee was the class of the field. Tommy Thompson was the only driver to stay within reach throughout the day, coming in just over a tenth back of Schoombee’s qualifying pace. Schoombee would lead green-to-checkered in both heat races, with Thompson running in tow. Clean off the line, Schoombee continued his run at the point to lead all 20 laps of the main event for his second-straight feature win and third of the year. Unable to attack early, Thompson held his ground in the runner-up spot for a third straight race – with Brad Dunford posting his third podium finish of the season. The second round of the Superkarts! USA Mountain Region took place this past weekend (June 19-20) under perfect Colorado weather at the very fast IMI Motorsports Complex in Dacono. The two days of action was a clean of any rough driving or series incidents, sending everyone home safe Sunday evening. Topping the result sheets at the end of the weekend were debut victories by Matt Kistler and Rory Mackey in the competitive S2 and TaG Senior categories while Christian Schurman scores win number two on the season in S5. Taking a two-year lay off of racing for college, the talented local shifterkart driver returned to make his debut at the SKUSA MR program in S2 Semi-Pro Stock Moto. His debut put him at the top of the time sheets as he secured the pole position with a 51.656-lap, over two-tenths quicker than Cory Milne and Christian Bird. Kistler went flag-to-flag in both 10-lap heat races by a comfortable margin over Milne with round one winner James Michael Sullivan and Sabre Cook each running third. The 20-lap main event was all Kistler as he led each lap to score the victory by 12-seconds over Cook with Milne taking the final podium spot over Logan Jones and Sullivan. The chase for the 2010 ProKart Challenge South titles are heating up as the series prepares for the fifth round of the six-event series. On June 25-26, the Superkarts! USA Southern California regional program will head to the Buttonwillow Raceway Park to compete on the challenging 7/10-mile kart track. The fifth round will be important for those looking to establish themselves as the championship leader, with the program counting all six rounds toward the title standings. With points counted each time the drivers hit the track, Buttonwillow will sort out the contenders from the pretenders. As it should be, the headline category – S1 Pro Stock Moto – has the closest battle heading into Buttonwillow. SKUSA SpringNationals race winner Clinton Schoombee holds the point lead by a slim five points over Tommy Thompson. Schoombee has two feature wins to his credit, while Thompson has yet to taste victory but has been the more consistent driver over the first four rounds. Lurking behind are Brad Dunford and Peter Abba, waiting for the top two to make any mistakes and capitalize on them. TaG Senior has been just as close, with the veteran leading the young rising star. SKUSA Pro Tour championship leader Phil Giebler holds the top spot in the PKC South chase as well, holding a 28 point advantage over Kyle Shriver. Giebler has one win along two other podium finishes, while Shriver has yet to score a victory.